Word Grammar is a theory of language structure based on the assumption that language, and indeed the whole of knowledge, is a network, and that virtually all of knowledge is learned. It combines the psychological insights of cognitive linguistics with the rigour of more formal theories. This textbook spans a broad range of topics from prototypes, activation and default inheritance to the details of syntactic, morphological and semantic structure. It introduces elementary ideas from cognitive science and uses them to explain the structure of language including a survey of English grammar. Richard Hudson is Emeritus Professor of Linguistics at University College London. His recent publications include Language Networks: the New Word Grammar (2007). 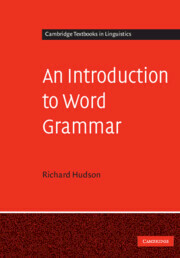 An introduction to word grammar / Richard Hudson. 1. English language–Grammar. I. Title. II. Series. 3.6 Do networks need modularity? 7.1 Two syntactic analyses of Cows eat grass. 7.2 Two syntactic analyses of Hungry cows eat grass. 7.8 Three alternative analyses of the imperative Hurry! 7.11 The triangular dependencies of He keeps talking. 8.13 The meaning of He can swim.